RIO DE JANEIRO, BRAZIL – Cyclist deal with the risk of having their bicycles stolen on a constant basis, and with the value of many bikes being higher than a monthly minimum wage in Brazil, the situation is not likely to get better soon. However there is new hope of recovering stolen bikes now with a recent cooperation between local police and web site Bicicletas Roubadas (Stolen Bikes). There is new hope in Rio of recovering stolen bikes now with a new cooperation between local police and web site Bicicletas Roubadas (Stolen Bikes), photo internet recreation. The site works by the victim of the bicycle theft filling out an electronic form, clicking the “Incluir Bike” option from the top menu. By submitting the registration, the system will generate an electronic billboard for the victim, which can be printed for a record. The listing is then locked so that the registration can be reviewed and verified by staff. After analysis, the record is posted in the site. The name of the victim and email is is secure in the system, thus preventing unauthorized emails or any problems with privacy. If someone wants to contact the victim, they can send an email using a special form whose link is indicated on each registration. Now according to an O Globo report, 75 bikes seized by the 10th DP (Botafogo) are already registered on the site which was activated yesterday (Friday), each showing a photo, serial number, make, model and color of each. Next month, others 205, recovered by the 14th DP (Leblon), will be posted on the site. 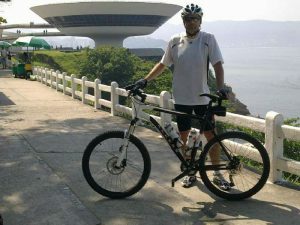 Unfortunately less than a month ago a cyclist was stabbed and killed while taking his usual route around 7:30 PM along the Lagoa in Zona Sul (South Zone). The assault was the latest in a series of incidents around the popular Lagoa neighborhood and affluent surroundings.